Seven months after acquiring the motorcycle-specific assets of Brammo, Polaris Industries introduces its first all-electric motorcycle in the Victory Empulse TT ($19,999). With a claimed range of 140 miles, 108 mph top speed and estimated 3.5 hour charging time, the Empulse is targeted to techie riders looking to free themselves from addiction to the gas pump. Based off of Brammo’s final Empulse R, the Victory iteration borrows the architecture, including super slim twin-spar aluminum frame, Marzocchi front suspension, Brembo sourced braking hardware and water-cooled AC motor. However, the motor pulls energy from a larger capacity lithium-ion power pack rated at 10.4 kWh — nearly a 12% increase over Brammo’s version. Aside from the updated power supply, color and Victory badging, it’s the same American-made e-bike. But that’s not a bad thing. Swing a leg into seat and the 460-pound TT feels compact — similar to a gasoline-powered 650cc class street bike (think Kawasaki ER-6n and Suzuki SFV650). Its ergonomics are natural, proportioned well and lend itself well for upright jaunts. True, the TT feels a tad porky at a standstill, in motion its favorable center of gravity (the heavy bank of batteries are positioned low in the chassis) make it feel lively with it scooting across the road in a pleasing manner — similar to a full-size scooter. Victory claims that its Empulse TT can be fully recharged using its SAE 1772 power adapter in 3.5 hours. Although touted in press material as a street-legal electric race motorcycle, the TT is anything but. Yes, it changes direction well and is generally friendly to ride at a moderate, around-town cruising pace, but when ridden in a sporty manner Victory’s e-bike feels vague and disconnected. Specifically, the chassis feels overly rigid with minimal weight transfer during corner entry on the brakes or, vice versa, at corner exit getting on the throttle. This combines to give an unnatural feeling compared to the more traditional pitch and bite handling of a gasoline-powered bike. Twist the throttle and it’s impressive how smooth and well-calibrated the twist grip is to the AC motor. Throttle response is direct, yet not overly so, allowing the rider to get comfortable with the motor’s flat spread of propulsion. The Empulse gallops to freeway speed quickly while the motor emits a playful sci-fi whine adding an element of excitement to the ride. A ‘sport’ mode is also offered, which sharpens motor response further, and also reduces engine braking effect slightly. Speaking of engine braking, the motor integrates re-generative braking technology which helps convert the ‘engine braking’ effect of the motor to re-charge the power supply slightly whenever coasting, off the throttle. Victory claims that the TT’s permanent magnet motor pumps out 54 horsepower and 61 lb-ft of torque — a respectable claim that feels within the ballpark compared to a piston-driven bike. The Victory Empulse TT is powered by a water-cooled electric motor capable of reaching a top speed of 108 mph on flat asphalt. Keeping tabs on the Empulse’s quiet heartbeat is a simple but clean looking dash display. A straightforward analog-style tachometer lets you know when the motor is operating in optimum efficiency (4500 to 6500 revs), with a smaller rectangular LCD showing vehicle speed, as well as the batteries’ remaining power percentage, in addition to estimated charging time (when plugged in). An EV-industry standard SAE J1772 power receptacle can re-charge the Empulse’s power cell up to 80% capacity in two hours, with a full-charge taking 3.5 hours. Although Victory optimistically assures a 140-mile range between re-charging, during our racetrack-only test, with unlimited access to power in-between 15-minute or so riding sessions, the machines were frequently low on battery capacity making us question real world range. 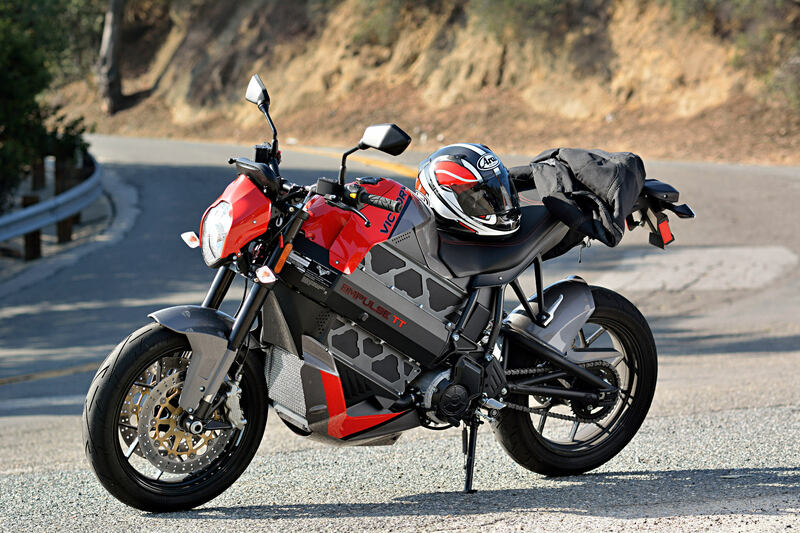 Contrary to other EV motorcycle designs, the Empulse employs Brammo’s one-of-a-kind six-speed transmission and clutch. This gives a more conventional and tactile riding experience compared to other fixed-speed twist-and-go platforms. It also maximizes the powerband of the motor, allowing it to operate near optimum efficiency, thereby extending range — especially during freeway rides. Even with the manual-style clutch/transmission, the Empulse remains twist-and-go scooter simple to ride. Don’t feel like working the clutch or gearshift lever? Then don’t, as the Victory is content being ridden in any of its six gears. Though, to be fair, top speed is limited slightly in the lower cogs. Working the clutch is optional, too, with the only time it’s really necessary during downshifts (upshifts can be made without its use — similar to a gas-powered bike). This makes us question why it employs so many gear options. A more realistic approach would be three-speeds (low/medium/high). Fit-and-finish has historically been a point of contention on Victory Motorcycles but the Empulse stands out with its quality craftsmanship. From the switchgear, to the precision frame welds this e-bike looks and feels like a quality piece of hardware. As of this test, each bike is assembled out of Brammo’s Talent, Oregon facility, but Victory plans on relocating assembly to its Iowa manufacturing facility in the future, using Brammo’s existing tooling and manufacturing processes. If you’re seeking a quality EV motorcycle to jet around town on the Empulse TT may fit the bill. Sure, it’s not the fastest electric bike on the road, but considering its versatile powertrain, easy handling and five-year warranty, Victory’s new e-bike will make you seriously consider riding electric. Rake: 24.0 deg. Trail: 3.0 in. Victory’s Empulse TT is toted as a street-legal electric racebike the Empulse’s chassis could offer better sport handling performance. Specifically, its chassis feels overly rigid and vague through turns even with the fitment of Continental’s high-performance Sport Attack 2 rubber. Seven months after purchasing the motorcycle-specific assets of Brammo, Polaris launches its first all electric motorcycle in the Empulse TT.